It is very helpful for budgeting and reporting. I love how easy it is to automate reports and presentations. It can be more difficult to plan specific activities. It feels more high-level than activity-level. It shows totals rather than individual transactions (either past or future transactions). Flexibility, engagement, training resources, updates, cost, implementation, ease of use, support; these are the reasons why I would recommend Power BI. Power BI is best suited for situations where collaboration is needed among several different groups who are working concurrently on different activities. Where there are multiple levels of data that need to be parsed through. It's difficult to think of a scenario where it wouldn't be beneficial other than the obvious. I love how easy it is to track software and general amortizations in Adaptive. The software has been an issue with my past employers, but it flows very easily here in Adaptive. We also use Adaptive's OfficeConnect for easy reporting. It has helped us automate our reporting as we work with internal departments. We have the reports built, and the software and can refresh all of them simultaneously, reducing generation time and giving us more time for analysis. We are building out more operational metrics now. We are starting to track sales opportunities across different business segments to see the correlation between spending activities and opportunity generation. This helps us set better targets in the future. This paired with OfficeConnect also makes it very easy to track and report on operational metrics in addition to financial metrics. Ease of use: For end user Microsoft Power BI is incredibly easy to use. Excel is simple for most people. The presentation through SharePoint gives users with any medium the ability to instantly use the dashboards. End users are able to use mobile, local and just about anyway they would choose. High Adoption Rate: We had a very high adoption rate causing many of our users to be incredibly engaged. The adoption of is due to many users already familiar with the tools they grew up on. If you grew up on Excel, then you will instantly feel at home in the tools. The new add ons are rarely a challenge even for novice users. Mapping functions: The mapping functions are one of the cooler features. Power Maps automatically recognizes zip codes and other addresses much like other packages. The one item I really liked was the ability to create a movie file that would play over time showing the growth across a map through the different areas. Saved as a MP4 then blended with music made this function particularly delicious for many of our end users. The Gateway: MS has provided a really cool little trick. The Gateway. I will explain this part later in my review. We have renewed this a number of times. It fits our business model and it is now an integral part of our organization. The product has been reliable. SQL Server Reporting Services (SSRS) can drag at times. We created two report servers and placed them under an F5 load balancer. This configuration has worked well. We have seen sluggish performance at times due to the Windows Firewall. We are not currently utilizing Microsoft's technical support. This training was more directed toward what the product was capable of rather than actual programming. I have used on-line training from Microsoft and from Pragmatic Works. I would recommend Pragmatic Works as the best way to get up to speed quickly, and then use the Microsoft on-line training to deep dive into specific features that you need to get depth with. Be prepared to help business users define their data. We found that different campuses had different definitions for the same thing. This took some change management and negotiating to get each team to come to a common understanding. We did not go through a full-blown software selection process, nor have I used other products in the past. Previous to Adaptive, we used Management Reporter (formerly FRx, now part of Microsoft Dynamics GP) for our financial statements, and Excel for our budgeting. Adaptive is far superior to either of those.We pursued Adaptive mainly through word of mouth. When discussing the availability of products with other accounting professionals, it was clear Adaptive was becoming the industry leader for our company size. We had a demo of the product presented by them. Since we liked it so much, we decided to go with them even though we had not reviewed other products. Microstrategy - I went with Microsoft BI because of features, usability, integration capabilities, performance, availability of talent, cost, and end-user (self-service) capabilities. Adaptive offers plenty of flexibility with what-if scenario modeling. It's very easy to save different versions of the plan/forecast and to control access rights to the versions. It's possible to hide versions from all users or to set them as read only. Adaptive makes month end variance analysis very straightforward. Comparing actuals with budget/forecast is quite simple and efficient. It's easy to do a high-level comparison and then to do a deep dive where needed. Also, the budget managers can perform their own reviews simultaneously. We've been using the software for 5 years and our budget/forecast cycles change all of the time. 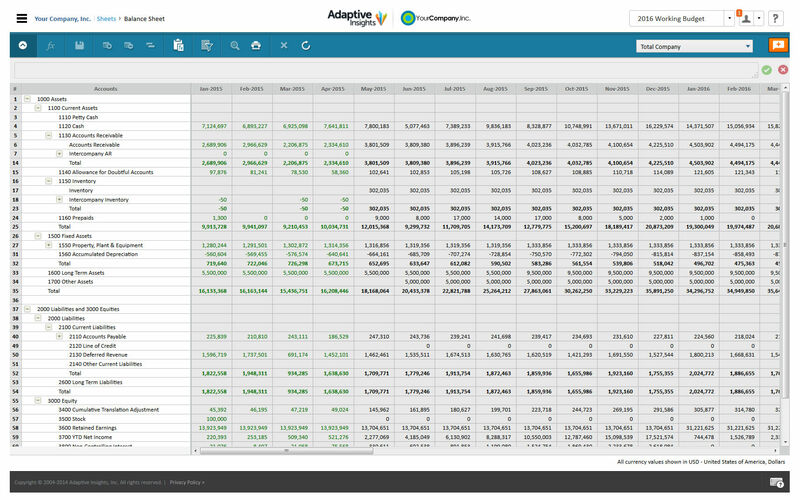 Adaptive offers the flexibility needed to create rolling forecasts that extend out several years. However, I wish that it was easier to roll forward historical results into future periods - there's a mix of actual/budget data that gets rolled forward and there's a lot of editing required to arrive at a baseline budget. Once organizations implement Office 365, the potential for added business with Microsoft BI will really manifest. At this time, the slow adoption of Office 2013 or more recent is limiting the analysis and visualizations capabilities of our average client.